Online Degrees | Blog | Why Pursue a Forensic Accounting Degree? Many aspiring accountants recognize the value of earning a master’s degree, but fewer have considered the advantage of specialization. It’s important for prospective ­students to consider a school that offers a broad range of options. NEC offers opportunities to pursue different accounting degree options. Recent research promotes the idea of specialization. Writing for Chron, Kristine Tucker notes that specializing in a particular area of accounting is one way to stay competitive in the field. Graduate students at New England College can choose between two different options: pursue a general Master of Science in Accounting or choose to focus on forensic accounting. Students who choose to pursue a forensic accounting degree may reap several benefits, including a competitive edge when applying for jobs. Building a more competitive resume. Finding challenging and rewarding work. The goal of the new AICPA certificates — the Core Forensic Accounting Certificate and the Specialized Forensic Accounting Certificate — is to help applicants prepare for the Certified in Financial Forensics (CFF) credential exam. Earning these certificates also helps to streamline the process of obtaining the CFF credential by reducing the education requirement from 75 to 59 hours. The coursework in New England College’s online master’s degree in forensic accounting can cover many of the topics included in the exam, giving our graduate students a solid foundation as they work toward adding the AICPA’s CFF credential to their resumes. Graduates will still need to complete a few additional requirements to earn their CFF credential, including passing the CFF exam and logging at least 1,000 hours of forensic accounting experience. However, earning a Master of Science in Accounting — Forensic Accounting can be an extremely helpful first step for accountants who want to build a more competitive resume. This degree can also help students prepare for the CFE exam, which they must pass in order to earn the Certified Fraud Examiner credential from the Association of Certified Fraud Examiners (ACFE). PayScale lists $50,071 as the average salary for accountants and $19.64 as the average hourly pay rate. Salary ranges for accountants can fall between $34,125 to $70,722 and hourly rates ranging from $13.76 to $29.10. Accountant salaries tend to increase with experience, but they remain relatively stable after the first five years. Those with less than five years of experience report average salaries of $46,000, while those with five to 10 years of experience report salaries that average $51,000. That figure increases by only $2,000 for those with 10 to 20 years of experience, and $3,000 for those with over 20 years of experience. According to Payscale, the salary potential for forensic accountants averages $65,660 and a range of $41,174 to $118,451. Even forensic accountants with less than five years of experience average $60,000 per year. The average rises to $79,000 for those with five to 10 years of experience and $100,000 for those with more than 20 years of experience. Industry statistics suggest that students pursuing a Master of Science in Accounting may have a bright future ahead. In fact, according to the U.S. Bureau of Labor Statistics, employment for accountants and auditors is expected to grow 10 percent between 2016 and 2026 — faster than the 7 percent growth predicted for all occupations. If these estimates hold true, then even general accounting graduates should find no shortage of job options. A specialization in forensic accounting, however, can open even more doors. Perhaps the most obvious path for forensic accounting graduates is a career as a fraud examiner or forensic auditor. These roles are reactionary in nature, with the accountant acting as an objective, authoritative third party to establish the facts of a case, analyze financial information, and offer a professional opinion. Forensic auditors review a company’s financial information for legal purposes. They look for evidence of fraud, embezzlement, related crimes, and other accounting irregularities. Forensic auditors are often called on to report their findings in court to support a criminal or civil case. Forensic auditors can also assist in divorce proceedings. When marital assets are being divided, it’s important that assets be assigned an accurate valuation and that no assets be left unreported or improperly handled by either party. A forensic auditor can help with asset analysis as well as any post-divorce tax issues. This type of accounting professional provides the expert services necessary to ensure fair legal handling of the financial aspects of a divorce. Unlike other forensic audits, fraud examinations are specifically conducted by CFEs — certified fraud examiners who have earned the proper credentials from the ACFE. CFEs may have more specialized or advanced training than forensic auditors, and they may be subjected to more high-pressure court situations. CFEs learn how to gather evidence, take statements, and testify about their findings in court. Another career path for forensic accounting graduates lies in the realm of corporate security and risk management. As the value and specialized knowledge of forensic accountants become more widely recognized, some companies are recruiting them for internal positions. Large companies have also begun hiring forensic accountants as a protective measure. After all, the same knowledge and expertise used to uncover accounting issues after the fact can be used to prevent them in the first place. The advice of a forensic auditor can be invaluable when a company needs to make a major financial decision and wants to avoid inadvertently running afoul of any regulatory agencies. Corporate security and risk management professionals help businesses strategize and minimize the risk of investigation and legal trouble. They may even be responsible for preparing and presenting reports directly to shareholders. In some cases, a forensic auditor is brought in to help a company prepare for an impending court case. 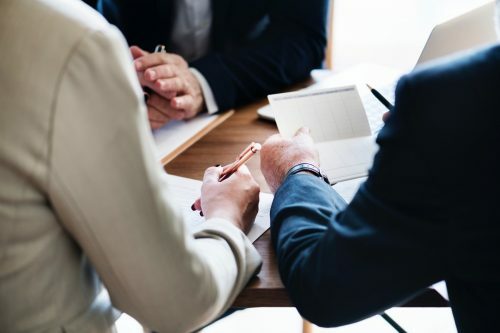 Just as plaintiffs and prosecutors might rely on a forensic accountant to support their case, the accused may hire an expert to assist with their defense. Regardless of the specific career path a student chooses, forensic accountants will find that their work lies at the intersection of multiple disciplines. For example, fraud examination combines criminal justice with accounting, while accountants who work in corporate security and risk management require broader and deeper business knowledge than their peers. The latter also need to be able to communicate clearly with both executives and shareholders. Forensic auditors who are consulted in divorce proceedings must be familiar with family law, and any accountant called upon to testify in court must develop the skills necessary to testify with confidence and competence. Forensic accounting can be more complex than the typical accounting job, but it is also marked by more nuance and variety. The extra layers add a richness to the job that many will appreciate. Those who thrive on new challenges, in particular, will find forensic accounting to be a rewarding choice. Although some accountants enter the field with only an associate’s degree or bachelor’s degree in their educational background, the best jobs and highest salaries typically go to the most qualified applicants. A few years of experience can make a difference, as can education level and certifications. However, one of the top ways for job seekers to separate themselves from the competition is to specialize. The New England College School of Graduate and Professional Studies offers important options to help students pursue a specific accounting career path tailored to their career goals. To learn more about the benefits of pursuing a Master of Science in Accounting – Forensic Accounting, visit the New England College School of Graduate and Professional Studies.